The displacement of refugees has been an international concern in recent years. A talk at the Eastern Diocese’s Krikor and Clara Zohrab Information Center looked at a related humanitarian emergency from a century ago, that developed at the Caucasus front following the Armenian Genocide. Asya Darbinyan spoke on the subject on Thursday, January 17, at the Diocesan Center in New York. She was introduced by Zohrab Center director Dr. Christopher Sheklian, who detailed her background as a Ph.D. candidate at the Strassler Center for Holocaust and Genocide Studies at Clark University in Worcester, MA. To begin her talk, Ms. Darbinyan noted how a century ago, the Armenian writer Hovhannes Toumanyan recorded his observations after arriving in the town of Etchmiadzin to help to the thousands of Armenians fleeing across the Ottoman border of Transcaucasia. Between 1914 and 1917, thousands of Armenian refugees escaping from Turkey across the border to Transcaucasia came from Kars, Igdir and Julfa. Two-thirds of them were women, since most of the men had been slaughtered. More than 200,000 refugees from Turkey had reached the Caucausus between July and August 1915. Upon arrival, they were accommodated in Yerevan, Elizavetpol, Tiflis, and Kars. 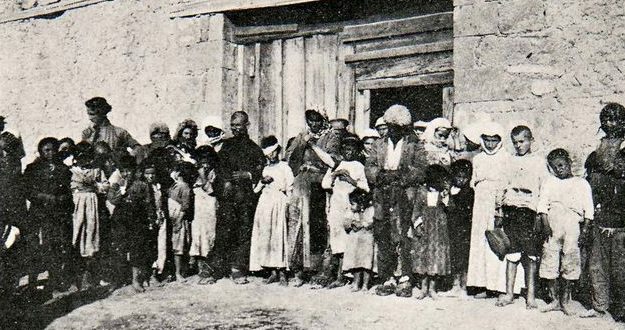 The local Armenian populations “mobilized all their resources towards the organization of relief work for the displaced Armenians, many of whom were very poor, disabled, and in need of urgent assistance,” Darbinyan related. Reports of Turkish atrocities against the Armenians and the Caucasian humanitarian crisis quickly reached the imperial Russian authorities. The Russian government as well as a number of non-governmental organizations in the Russian Empire provided humanitarian assistance to thousands of Armenian refugees, the speaker revealed. Two prominent Armenian organizations in the Russian Empire that addressed the Armenian refugee crisis were the Caucasus Armenian Benevolent Society with its 72 branches, and the Armenian Central Committee in Tiflis for its assistance to victims of war. Both established hospitals and feeding stations in more than a dozen cities and towns. The Moscow Armenian Committee mainly operated in Yerevan opening a hospital, a food depot, three orphanages, and a school for 110 orphan-students in Ashtarak, and Etchmiadzin. And the Committee of Brotherly Aid was a major institution with branches in Etchmiadzin, Alexandropol, and other major areas which was under aegis of the Catholicos of All Armenians. With the emergency growing speedily, the Russian imperial authorities established the Special Council for Refugees to ensure the efficiency of the refugee humanitarian activities, issuing cards to all identified refugees for food and medical assistance. They also insisted that able-bodied refugees find work in farming and workshops and help with the education of refugee children who were housed in orphanages throughout the Caucasus. Other Russian aid groups included the All-Russian Union of Towns and the Caucasus Committee. The Russian motivation was complicated. Ottoman Armenians wondered whether Russia was a savior or another imperial master. Russian policy towards Armenians had generally fluctuated depending on the economic, military, political and geographical developments in the region. According to historian Avetis Harutyunyan, “Russian imperial authorities never actually aimed at protecting Armenians.” Their relief work was just the “by-product” of Russian imperialist and colonization policies. Historian Peter Holquist wrote that when the war was waged, “urgent military interest, rather than an anti-Armenian policy shaped those decisions.” Another historian Halit Akarca called Russian policy in Eastern Turkey during the war as “humanitarian occupation,” motivated by strategic and political concerns. Above: Armenian refugees at the Caucasus front during World War I. Why no mention of the Presbyterian church…. didn’t they provide orphanages?